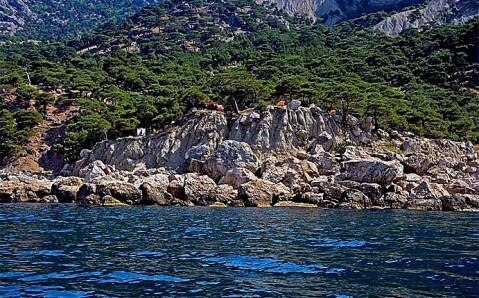 Amazing and inimitable Cape Aya is a 500-meter high steep wall jutting out into the sea. It is one of those places, which you visit once and then strive to rediscover them once again. 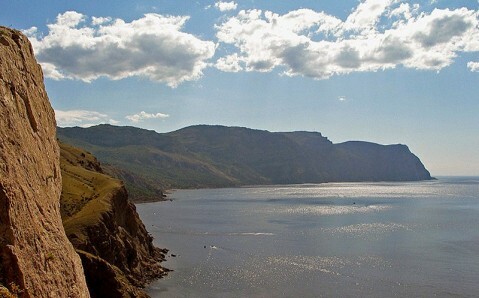 It's Crimean peninsula's unique protected corner, whose lovely seaside landscapes are not inferior to fabulous Mediterranean sceneries. Here you will find everything necessary for full-blown recreation: clean air saturated with juniper trees' aromas, Laspi Bay's azure waters and incomparable Crimean Mountains' aura. 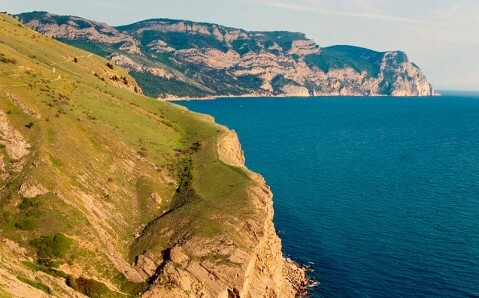 Situated not far from Balaklava, Cape Aya is a symbolic western border of the Southern Coast of Crimea. Its name derives from Greek 'ayos' - 'the holy one'. 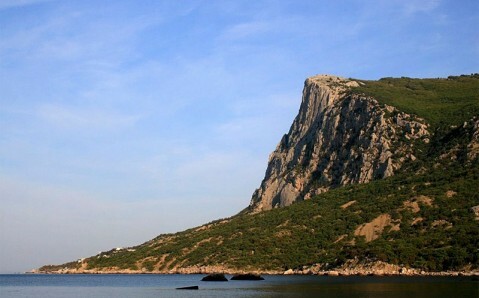 Cape's powerful body consists of marble-like limestone rocks that are covered with relict plants. The highest one is Kokiya-Kiya, or Blue Cliff (558 meters above-sea). Thanks to wonderful microclimate, rare plants and animals found a shelter here. 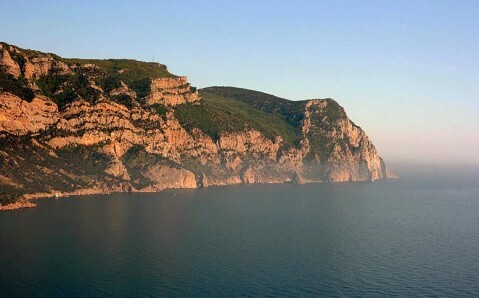 In order to preserve them in primeval state, the National Landscape Reserve 'Cape Aya' was created. Its flora consists of 500 plants' kinds, among which many are entered in the Red Book. This peculiar natural corner is probably the only one, where one can see such valuable trees as Greek Strawberry Tree with pink-red trunk and shining emerald leaves (popularly known as 'hussy'), Greek Juniper and Turkish Pine. It is the groves of relict pines with dark-green long needles and big single strobiles that make Cape Aya unique and inimitably beautiful. Reserve's fauna is also rich with rare species. Extinct bats, stone-marten and weasel, leopard and four-lined snake live on its territory. There are also fauna representatives common for mountain and forest Crimea: roes, deer, wild boars. And in water area near the cape (it is also part of the reserve and is strictly protected) you may see three dolphins' species, spurdogs, rapanas and grey mullets. Fantastic grottos lurk at cape's foot. Some of them were once used by Imperator's Black Sea Navy for adjustment of ship guns' fire: today the cannonballs' impact marks may be seen on the rocks. One of the most famous Cape Aya's sites is Laspi Bay - the true natural miracle with magnificent pebble beaches and the cleanest sea. 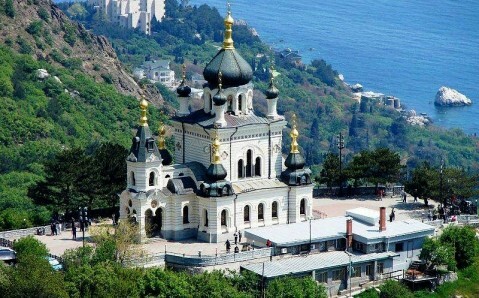 Due to its isolation from the outer world by the mountain range, which reliably protects it from winds and cold Yalta current, it is the warmest place at the Southern Coast of Crimea. Although the unique Cape Aya's natural complex is strictly protected, it is still possible to get here, but only along ecological paths. Special camping stations are arranged here for recreation. Getting here. 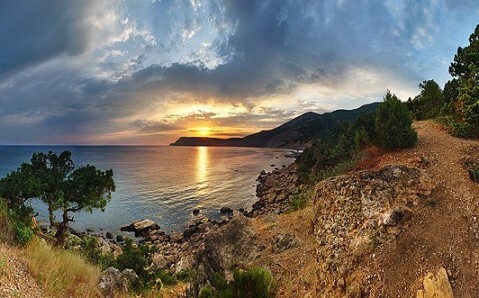 Cape Aya is situated 8 km away from Balaklava and 20 km away from Sevastopol. You may reach it by any bus going in Yalta's direction. Go to the turn to Cape Aya and then walk along one of the many tourist trails. Local beaches may be also reached by the sea - by passenger ships (around 20 UAH) or by private skiff (from 15 to 30 UAH).